Pakistan’s Prime Minister Imran Khan has called for talks with India after both sides said they shot down each other’s warplanes, something that has not happened since the nuclear-armed rivals went to war in 1971. “History tells us that wars are full of miscalculation. My question is that given the weapons we have can we afford miscalculation,” Khan said during a brief televised broadcast to the nation on Wednesday. “I once again invite India to come to the negotiating table,” Khan, who has called for dialogue with New Delhi in the past, said. The Pakistani prime minister said his country was ready to cooperate with New Delhi into the investigation of a suicide bombing in India-administered Kashmir, claimed by Pakistan-based armed group, Jaish-e-Mohammed. India blamed Pakistan for “controlling” that attack, and Prime Minister Narendra Modi, who is facing general elections in April and May, vowed a “jaw-breaking” response. Indian fighter jets carried out predawn air raids on Tuesday in response to the Kashmir attack that left at least 42 Indian soldiers dead. Earlier in the day, the Pakistani military claimed to have arrested two Indian air force pilots after shooting down two fighter jets, raising fears of a major escalation. India’s foreign ministry spokesman later confirmed that one of their pilots is missing and that they are “ascertaining the facts”. Foreign ministry spokesperson Raveesh Kumar also announced that a Pakistan jet was hit as it took part in an operation “to target military installations on the Indian side”. “The Pakistani aircraft was seen by ground forces falling from the sky on the Pakistan side,” he told a briefing. Speaking to reporters at Pakistan military headquarters in Rawalpindi, a spokesperson said Pakistani aircraft fired on six targets in Indian-administered Kashmir, hitting “open spaces” as a demonstration of Pakistan’s capability to hit Indian targets. The intention, the military spokesperson said, was not to cause any civilian or military casualties. Major General Asif Ghafoor, the military spokesperson, said Pakistan did not wish to escalate hostilities and urged India to engage in dialogue. “This was not a retaliation in a true sense, but to tell Pakistan has capability; we can do it, but we want to be responsible, we don’t want an escalation, we don’t want a war,” he told a news conference. Police officials in India-administered Kashmir said two pilots and a civilian had died after an Indian Air Force plane crashed in the disputed region, but did not confirm if the plane was shot down by Pakistani forces. Also on Wednesday, Pakistan closed its airspace for all commercial flights, its civil aviation authority said in a notice. Several airports in northern India were also closed, forcing airlines to cancel service to at least six cities. On Tuesday, Indian aircraft entered Pakistani airspace in Pakistan-administered Kashmir to fire four bombs that landed in the village of Jaba, about 10km outside of Kashmir in Khyber Pakhtunkhwa province. 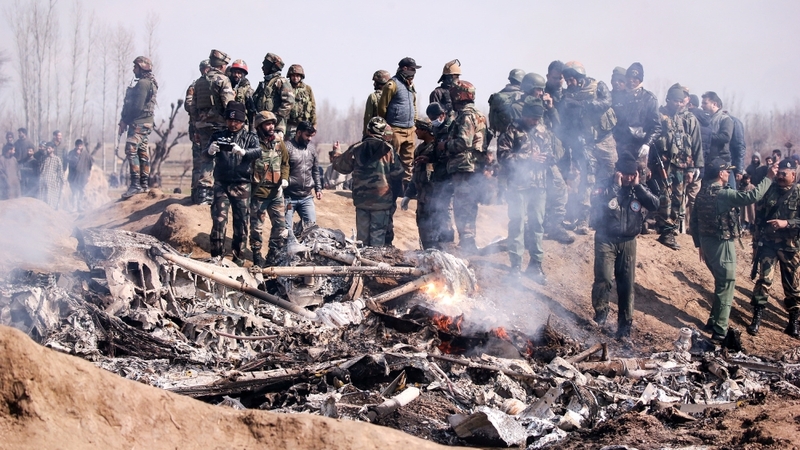 In a foreign ministry statement, India claimed it had destroyed a “Jaish-e-Muhammad camp” in Jaba, but Pakistan’s military and witnesses at the scene said the bombs struck a mostly uninhabited forest. One man was wounded in the attacks, with local hospital officials reporting no other casualties. It was the first time Indian jets had entered and fired inside the Pakistani territory since a war between the two countries in 1971. India and Pakistan have fought two of their three wars over the disputed territory of Kashmir, which both claim in full but administer separate portions of, divided by a Line of Control.